Fulltime enrollment details either at an American college or University level for the present academic year. Must have a good standing in current academic institution. Must have an exemplary involvement as a community. Candidates aging less than 18 must be permitted by the guardian or parents to participate in the scholarship program. Fill out the application featured below on this page. Write your name and current school or institution you will be attending during mentioned academic year, and a valid email address. Must include phone number, name, and email address for the references that can identify your credentials as a viable applicant for scholarship. Using answers to clearly describe your reason and your aim to apply for scholarship. As of now, applications are being accepted, so you can apply anytime by Oct 30th, 2019. Winning contestants will be notified via email and will be announced by midnight on Nov 30th 2019. Scholarship payment will be remitted to student’s college or university account by Dec 6th 2019. The candidate must answer all questions in the questionnaire section. The desired college/ university must be located within the United States. All submitted applications will be reviewed by two of our employees. In the end, out of all candidates who applied for the scholarship, one winner will be chosen based on candidate’s activities and interest towards getting better education. References of all candidates will be contacted and verified. Likewise, references will have to testify candidate’s claims. Total scholarship value is $1000 and will be deposited by means of wire transfer. Applicable fees may apply. Candidate who will get the scholarship, he will be responsible to pay federal taxes as per the tax laws of that state. The recipient of the scholarship will have their picture, name, school or university name, and description listed in the recipient section of the website. Students of Universities and Community Colleges in the United States are eligible for the annual scholarship program as of now to anytime by Oct 30th, 2019. The only thing we ask universities and community colleges to help us promote this scholarship campaign to their current and upcoming students via their website or newsletter. 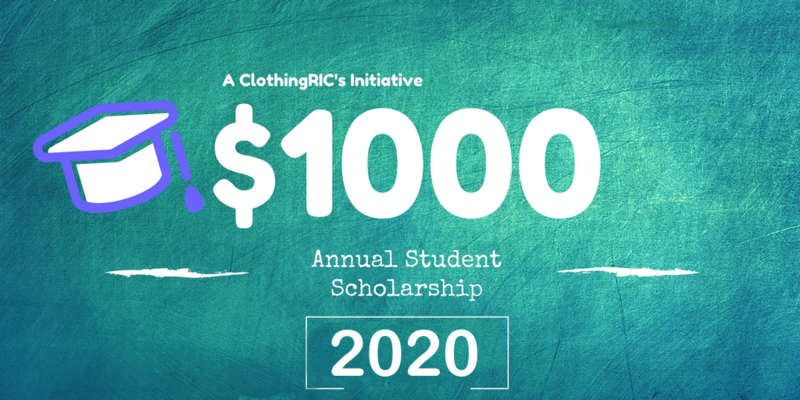 If you are interested in collaborating with us, send us an e-mail at scholarship@clothingric.com and we will get back to you within 72 hours. 1# What are your motives and aims in life? How will this degree contribute to it? 2# What will be the impact of this scholarship on your life and studies? 2# Write some practical tips to help students regarding ways to save while studying. For any queries regarding annual student scholarship program, feel free to contact us. You can send an email to scholarship@clothingric.com and we will make sure to answer your queries. Our response may take 72 hours. Be the first one to apply for the scholarship program to have sound studies and future ahead.